The Oberlin Heritage Center is pleased to announce the release of a new oral history publication featuring the stories of Oberlin women in the 20th century. 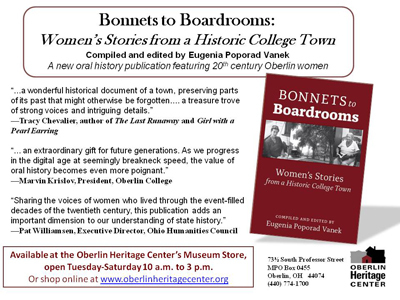 Bonnets to Boardrooms: Women's Stories from a Historic College Town was compiled and edited by Eugenia Poporad Vanek using stories gathered by the Oberlin Heritage Center's Oral History Project. Get yours today by shopping at the Museum Store in the Monroe House, downloading the order form below, or purchasing one online. As a special offer, we are waiving the shipping fee for deliveries within Oberlin.